The news that the Baggies had parted company with Roberto Di Matteo came as a bit of a shock not least because our Chairman has backed managers even through terrible campaigns that resulted in relegation. The irony is that despite going on an extended run of poor results Di Matteo's team is still better placed than any previous Baggies team at this stage of a premier league season. I think this is the nub of the issue. In previous seasons things were so hopeless and frankly the squad was so completely out classed changing the coach was like rearranging the deck chairs on the Titanic. However this time is different the squad is good enough to stay in the division. There are real rumblings of discontent amongst the supporters who have watched a side starting to disintegrate after a promising start to the campaign. 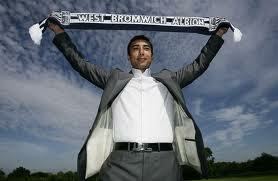 A straw poll on West Brom.Com was split 50:50 on whether DiMatteo should stay or go which I found surprising. Against this backdrop a change of coach might be the right thing to do if it saves our season and preserves our Premier League status then plainly it is the right move but it is a gamble and it does fly in the face of the clubs avowed aim to shun the short term ism that is rife in football. The stark fact is that our form has been poor for 2 months and DiMatteo seemed almost powerless to put things right. Some of his team selections have been downright erratic and he has taken to bemoaning poor refereeing decisions and injuries as the root cause of the malaise. Yes there have been some shocking decisions go against us but in many instances we were already behind in the game because of our own ineptitude. Personally I would have preferred us to back DiMatteo and give him a chance to turn things around but equally I had a growing sense of unease about our prospects for the rest of the season. A lot now hinges on the next appointment. To general relief it would appear that Big Sam has ruled himself out of the running. Derek McInnes would be a popular choice amongst fans because of his previous association with the club and a growing reputation as a dynamic young coach albeit at St Johnstone. If Roy Hodgson could be persuaded to take over the reigns I would be delighted but I suspect the answer will be no. The prospect of the Wally with Brolly just fills me with dread.